LAWRENCE — Everyone has heard of a friend, classmate, co-worker or associate described as creative. In Iceland, that descriptor can be applied to the majority of the nation’s population. By many international measures, Iceland is a leading nation in innovation and creativity in a number of fields, including design, music, art and literature. A University of Kansas research team has published an article examining what factors lead the small island nation to be so creative and to examine if any of the factors in their education system can be adopted in the United States. Barbara Kerr, Williamson Family Distinguished Professor of Counseling Psychology at KU, led a team that performed a review of research on factors leading to creativity and conducted interviews with Icelanders to gain insight into their creativity. They found that literature “supported the idea that ability and personality attributes of Icelanders might be the source of Icelandic innovation, including open-mindedness.” They also found literature claiming “open and egalitarian families, innovation education curricula and free play, cultural support for creativity, and government policies” were drivers of innovation to be accurate. However, Icelanders don’t necessarily view themselves as more creative than others and strongly dislike the popular assertion that their unique natural environment is the source of creative inspiration. The article, published in the journal Gifted and Talented International, was authored by Kerr and KU graduate students Maxwell Birdnow, Jenelle Hallaert, Keely Alexander, Robyn Malmsten, Olivia Stull, J.D. Wright, Brittany Lucas, Rachel Swanson and University of Iceland student Grace Claiborn. Kerr has performed research for years into creative and gifted students, including how to identify them and how to best support their education and aspirations. And while there is a good deal of research and theories on creativity and how it works in individuals and organizations, there is not much research on creative societies. It seemed like a study abroad graduate seminar was the perfect way for a large team to investigate the question of Icelandic creativity. The team conducted interviews with more than 15 Icelanders who work in a variety of creative occupations. They had a variety of ideas on why one in 10 adults in the country have published a book, why playing in a band is considered a rite of passage and why nearly everyone knows how to knit and sew. But they give credit to education and cultural factors, not to the idea of nature as inspiration, as is so commonly assumed about them. “You have many people who don’t realize just how creative they are. I haven’t met a single family there that doesn’t have someone in a creative occupation such as the arts, innovative and technological sciences, writing and new forms of creativity that technology has made possible like gaming and virtual reality,” Kerr said. Iceland made a concerted effort to introduce innovation education, or IE, into their curriculums more than 20 years ago and researchers and Icelanders alike agree it is key to their booming creativity. All children in schools devote time to learning to use tools, how to build and create all manner of products and more. Such practices are on the decline in the United States, where more attention is increasingly paid to testing. Icelanders test little, do not have IQ tests in school and focus instead on learning and applying skills in all areas of the curriculum. Some things are universal, however, as Kerr noted with a laugh that Icelandic youths view school as boring, just like so many of their international counterparts. Research and Icelanders also agree on their open culture and supportive family lives being key to fostering creativity. A minority of Icelanders marry, and a majority of children are born out of wedlock, but cultural ideas on child-raising are very strict. Mothers, fathers, siblings, grandparents, aunts and uncles and community members are all involved in child-raising, and the government provides free child care, allowing parents to work and create while their children are encouraged to take part in free play. The culture also celebrates differences, gender equality and human rights. In fact, their annual LGBTQ pride celebration is the largest in Europe and the largest festival in Iceland. While the idea of nature being a strong inspiration is disliked by Icelanders, the built environment is commonly cited as being key. Reykjavik, the major city, abounds with makerspaces where creative people can work together, coffee shops, art galleries and musical venues. And Icelandic cities have a good deal of public art, including people employed by the government as muralists, and many who have won government funding to support their art. Kerr said one aspect of Iceland’s unique environment is well-suited to creativity. The long, dark hours of winter lead residents to spend long periods of time indoors working together and the long summer days with little darkness lead to little sleep and uninterrupted periods of creation. The common criticism against small communities that "everyone knows your business" applies in Iceland, but it also makes it easier for creative people to get noticed, and Icelandic openness allows young people to try new things without being severely criticized. Young musicians, filmmakers and artists can be quickly discovered. While many of the advantages Iceland enjoys when it comes to fostering creativity are unique and inherent, several of the lessons can be applied in the U.S., especially in education, the researchers said. Kerr will lead another study abroad trip to Iceland this May to learn more about the role of gender equality in Icelandic creativity and well-being. This year’s students will examine how innovation education contributes to gender equality. Rarely practiced in the states outside of expensive private schools, Kerr said focusing on all girls and boys learning to engage in creative problem-solving could encourage young generations to become tomorrow’s innovators, artists and entrepreneurs. Photo: Icelanders rate as some of the most creative and innovative people in the world by many international measures. 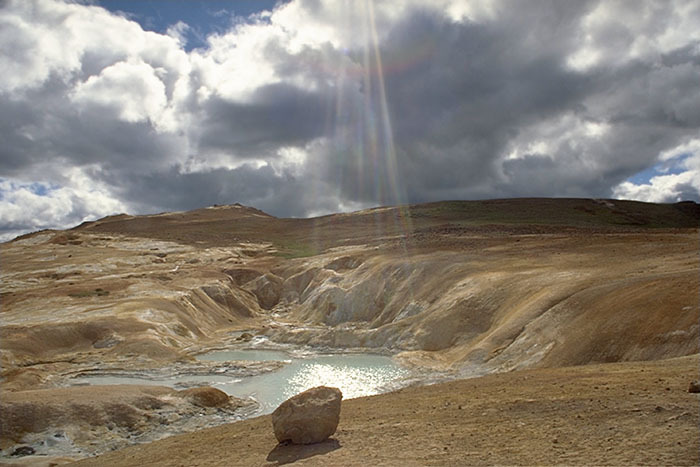 A KU research team has explored what makes Iceland's citizens so creative, including the common assumption that the island's unique natural environment, pictured above, is an inspiration. Credit: Andreas Tille, Wikimedia Commons.